#BeyondtheHashtags is a conversation seeking to evaluate the handling of the counter-terrorism operations in the northern part of Nigeria, with a special focus on the abduction of hundreds of Chibok school girls in Borno State. The May 20, 2014 Citizens Forum drew an impressive cast of independent legal experts, human rights advocates, community leaders, students, public servants, security operatives, media professionals, concerned citizens and civil society organizations, united by the determination to take the anti-terror campaign beyond street and online action. Building on the existing advocacy spaces and bonds of solidarity deepened by the hashtag campaigns, the forum offered a no-holds-barred arena to track the needs and gaps in the management of the Nigerian security crisis, and mutually demand answers to unresolved questions across the non-contentious divides. Click here to download the report. On Twitter, Spaces for Change created the hashtag: #AbductedBornoSchoolGirls to drive engagement and citizen action around the Chibok abductions. In its 8,520-member vibrant Discussion Forum hosted on Facebook, –http://www.facebook.com/groups/spacesforchange/ – S4C’s group administrators moderate online conversations generating hundreds and thousands of commentaries on the rising state of insecurity in the Northern Nigeria. These discussions interrogate the security infrastructure and military strategy of Nigerian security forces, and proffer youth-based proposals for developing appropriate strategic and tactical responses to the disastrous setbacks in fight against terror. Spaces for Change.S4C creatively coalesces research, new media advocacy, community engagement and policy action to increase the voice, visibility and capacity of the youth and local communities to campaign for peace and respect for human rights in Nigeria. Using media advocacy techniques to advance the campaign for peace and security is based upon an understanding that 21st-century communications technology has the potential to serve as a great equalizer, allowing those with little resources to use what they have—compelling news, messages and stories—to influence peers and people in positions of power and to improve their own lives. Beginning from February 2014 when 20 young female students were reportedly abducted from Government Girls Senior Science Secondary School and Ashigar School of Business and Administrative Studies, Borno State, S4C launched a people-powered campaign using both the formal and informal media to heighten awareness of the growing threats to educational freedom of young school girls in northern Nigeria. Capitalizing on its strong online presence especially on Facebook, S4C initiated daily public conversations around the abductions, sustaining the tempo of public outcry demanding for effective rescue operations and safe return of the school girls. Coordinated Protest Marches: Matching sustained media advocacy with offline action, Spaces for Change.S4C coordinated a protest march against the abduction of 20 Borno school girls on Friday, February 28, 2014. the protest march held in Yaba, Lagos involved non-governmental organizations, youth groups and young Nigerians embittered by the recurrent abductions and massacres of citizens across the country, most of whom are young people. S4C’s anti-terror social campaign, hashtagged, #NSAcounterterrorapproaches has helped to promote public awareness of the recently-launched security policy that employs a citizens-based approach to countering terrorism. In March 2014, the Nigerian National Security Adviser rolled out the soft approach to countering terrorism which comprehensively weaves multi-stakeholder engagement strategies with human rights compliant approaches of responding to, preventing and dealing with extremism and radicalization that lead to terrorism. Through its regular online engagements focusing on the terrorism question, S4C found that religious bodies, community movements, non-governmental organizations, civil society groups and mainly the youth have never heard about this soft program of counter-terror action. If properly communicated, the NSA’s new counter-terror framework can act as a vehicle through which citizens, civil society organizations, communities and government institutions can be empowered to understand and engage the security structures and undertake collective surveillance more effectively. “This Boat is Sinking”, an April 22, 2014 article authored by Spaces for Change.S4C’s executive director, which went viral on the internet raised important issues surrounding the handling of the search and rescue efforts; asked critical questions regarding the official documentation of the missing school girls and proffered recommendations for stemming the tide of insecurity across the country. Another expository article authored by S4C’s Victoria Ohaeri, “Understanding Nigeria’s Soft Approach to Countering Terrorism”, was published by three national dailies and online news sites, reaching millions of readers across the country. Abridging and illuminating the latest national policy for countering terrorism, the article is written in very simple language so that citizens, mainly the youth, organizations, including the private sector and all tiers of government can easily understand and play their individual and collective roles in confronting violent extremism in the country. Spaces for Change’s executive director has granted several interviews to local and international electronic and print news media discussing the implication of the Chibok abductions on girl-child education. 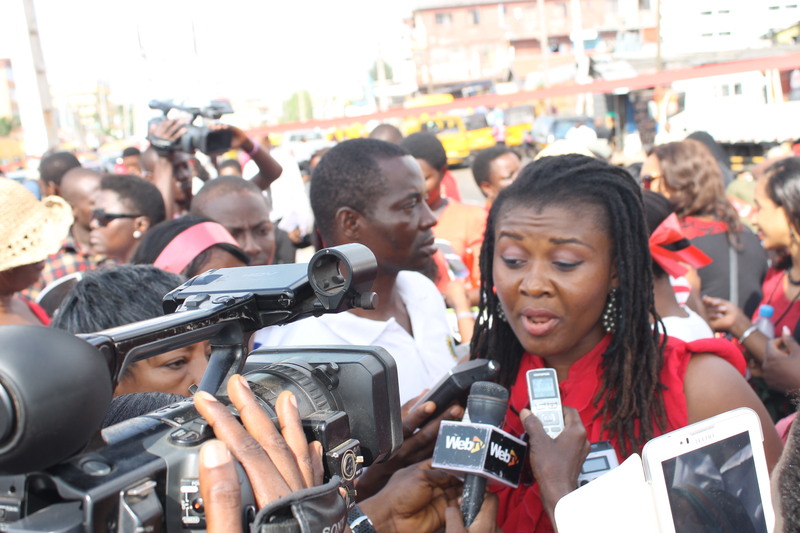 At protest grounds, press events, civil society convenings and private one-on-one interviews with news men, she speaks to the press on the issue of conflict and insecurity in northern Nigerian, in recognition of her experience in engaging with the volatile communities, and her first-hand knowledge of the social and economic conditions in those areas.